Five Russian Dog Stories (review copy from Hesperus Press) is… well, what do you think it is? For linguistic pedants, let me assure you that (with one exception) both the stories and the dogs are Russian. Anthony Briggs, a notable Russian-to-English translator (amongst other things, he has tackled War and Peace…), is the man responsible for this collection, selecting, translating and commenting on the stories in an excellent introduction. Another writer you’ll undoubtedly have heard of is Anton Chekhov, and while Chestnut Girl may not be one of his more famous stories, anything coming from the pen of the short-story specialist is bound to be good. In this story, a chestnut Spaniel gets separated from her drunken, boorish master and ends up finding a new home with a much kinder man – and his menagerie of talented animals. With a new name (and a new bag of tricks), our canine friend is ready to start a new life; however, what will happen when she is reminded of the past? The title of Mikhail Saltykov’s Good Old Trezor is intended to evoke memories of a book I read recently, Faithful Ruslan (also called Good Old Ruslan). However, where Ruslan’s tale is a lengthy, heart-breaking one, Saltykov’s story is a humorous, ten-page romp detailing the life of a hard-working guard dog. It’s a dog’s life alright, but Trezor seems to accept that this is his lot in life, and that there’s no point in complaining. After all, he is a dog. Still, it’s a lovely idea and one well worth a look, whether you’re a big fan of dogs or not. 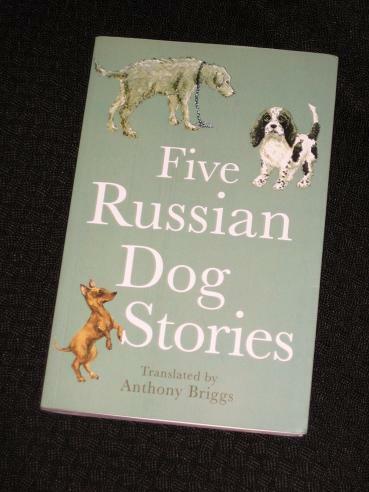 Indeed, the inside sleeve makes the claim that Five Russian Dog Stories is a “…delight for dog-lovers, with a passing interest for dog-haters…”. As a reader who falls somewhere between the two camps, I can heartily recommend it. Of course, I’m sure there many of you out there who are much more interested in dogs than I am. As Briggs says, humans and dogs have been companions for thousands of years, and the two species share a special bond. An anecdote the translator gives at the start of his introduction puts this nicely into perspective. One day, he and a friend visited an old pub in England and asked the landlord whether he would let the dogs into his establishment. His response? sounds like an entertaining book, one I could read to the family pet, unless I'm barking up the wrong tree.